Numerous Moroccan cookie recipes call for almond paste flavored with orange flower water and often times cinnamon. This popular version features almond paste enclosed in pastry dough and then rolled into a baton or cigarette shape. Golden unhulled sesame seeds garnish the ends and add more traditional flavor and texture. The cookies store well in an airtight container for up to two weeks , but you may want to freeze them instead. 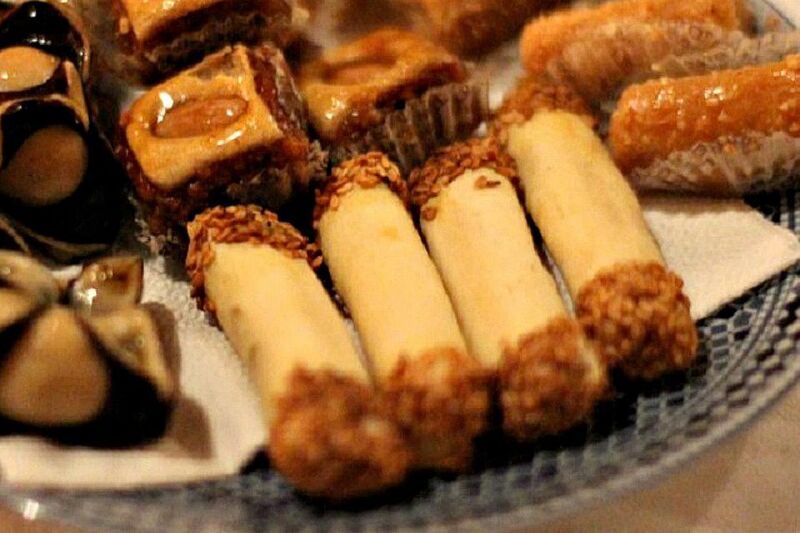 Also try Kaab el Ghazal, another almond paste cookie wrapped in pastry. Make the almond paste filling. Pass the almonds through a meat grinder twice to make a paste (or use a food processor to grind them as finely as possible, to the point the crumbs clump together and can be squeezed and molded together). Transfer the ground almonds to a large bowl and add the sugar, cinnamon, gum arabic, butter, orange flower water and egg yolk. Use your hands to mix the ingredients evenly and knead several times to make a moldable paste. Shape the almond paste into thin finger-sized logs. Shape the cookies. Lightly dust a work surface with flour and roll out one portion of dough into a paper-thin rectangle. Line up some of the almond paste logs in a row along one edge of the dough, pressing the logs together to join them into one long roll of paste. Fold the edge of the dough over the almond paste to conceal it, pressing the edge of dough to seal. Use a sharp, long knife to carefully cut along the edge of the wrapped cookie to separate it from the rolled out dough, then cut the long length of wrapped almond paste into small batons about the length of your little finger. Inspect each cookie to be sure the dough is sealed around the paste (pinch or roll the cookie back and forth to seal if necessary) then repeat with the remaining paste and dough. Garnish and bake the cookies. Preheat your oven to 350° F (180° C). Line a large baking sheet with parchment paper. Dip the end of each cookie in the egg white and then in the sesame seeds. Place the cookies seam side down on the baking pan, leaving a little room between cookies. Bake the cookies just until firm and lightly colored, around 15 minutes, but watch carefully as they should remain pale and not be allowed to turn golden. Remove to a rack to cool completely before storing in an airtight container.